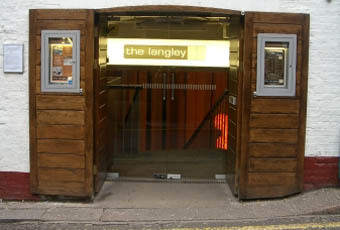 I went to The Langley with my fellow girlies on Saturday. We had a brilliant time!!! Great atmosphere, excellent live percussion and DJ,danced the night away with a few to many cosmos :) Highly recommended, will definately be back!!! really love this place, a great way to keep cool in this scorching summer heat. i am MD of a large company close to covent garden and am already thinking of holding our staff christmas party there this year!!!!! make sure you take full advantage of their Happy Hour the discounts are too good to miss. great for birthday and party bookings, and a mighty tasty restaurant menu also. ok i'll stop banging on about them know, go and see for yourself! a great secret of covent garden! lovely bar with a really wide range of drinks available. happy hour runs for about 3 hours which is a great treat, and i think that's every day too. i went in for my leaving do after a recommendation from a friend and the langley definitely came up trumps. i will be going baack very soon.